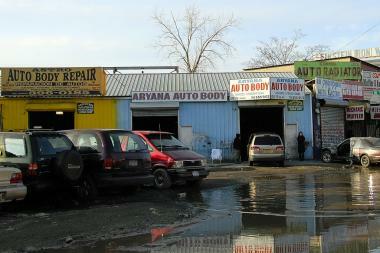 An auto-body shop in Willets Point. CORONA — A group of dozens of Willets Point auto-body shop owners have signed a lease to move to a Hunts Point warehouse in order to start making away for the planned, but controversial, redevelopment of the neighborhood, according to an organizer for the businesses. The deal, first reported Monday by the Wall Street Journal, will relocate between 47 and 60 businesses to the 150,000-square-foot warehouse at 1080 Leggett Ave., near the Bruckner Expressway, according to Marco Neira, an organizer for the Sunrise Cooperative, a for-profit collective jointly controlled by a group of auto body businesses in Willets Point. "We already have the place in The Bronx, we got the keys last Saturday," he said. The cooperative first eyed the location in December, and another organizer, Sergio Aguirre, said at the time that the light-filled warehouse was "the perfect place for shops." Construction managers will head to the warehouse Tuesday to give an estimate on the scope and cost to renovate the space, Neira said. The city is footing the bill for the security deposit and moving costs, and will pay for the first two years of the lease, Neira said. A spokeswoman for the Economic Development Corporation said the co-op is eligible for up to $2 million to put towards relocation, and each individual business is also eligible for additional funds. The move is also pivotal in keeping hundreds of jbs in New York City, she said. "The Sunrise Cooperative's move to the Hunts Point neighborhood in the Bronx ensures that hundreds of jobs will be retained and that dozens of businesses will continue to operate and succeed in New York City," said Kate Blumm. "We congratulate the Sunrise Cooperative on its diligence to successfully secure space at a new location that will help it thrive for years to come." The plan to turn the heavily polluted Iron Triangle from a stretch of auto body repair shops into a retail and residential destination, which drew waves of protest from business owners, was first proposed in 2008. The latest version of the plan, which requires the shops to vacate the neighborhood, will redevelop the area in phases, and was approved by the City Council in October. Many of the businesses pushed group relocation, saying that their success was contingent on sticking together and recreating an environment similar to that of Willets Point, where drivers could pick from a variety of repair options. Neira said he's excited for the move, and expects to get things going in the next few months. "Everybody feels happy, because at least we got some place to move up," he said.